Whenever I drive through an old town I instantly scan for a saloon. I don’t know why, but there is something about sitting in an old saloon and drinking a beer that is deeply satisfying. It’s as close as I will probably every get to time travel. I just sit there and look around and try to imagine being there 100 years earlier. Today was no different. On a sunny day drive out west of Redding, to Whiskeytown – which sadly is not even a real town – and then later up to French Gulch, I found just such a place. The town itself is very small, and the main street feels more like a residential side road, but there is a one block stretch of old businesses. The only two open today were both bars, across the street from one another. The buildings were original, and looked it, old and worn, with roof-lines rendered wavy by years of wear. The sign out front said the bar contained within the saloon was brought over from Europe in the late 1800’s and then stage coached up into its current home. Personally, I tend to be an IPA sort of guy, but when faced with the shelf of bottles serving as a beer list, one stood out as the right beer for such an occasion. 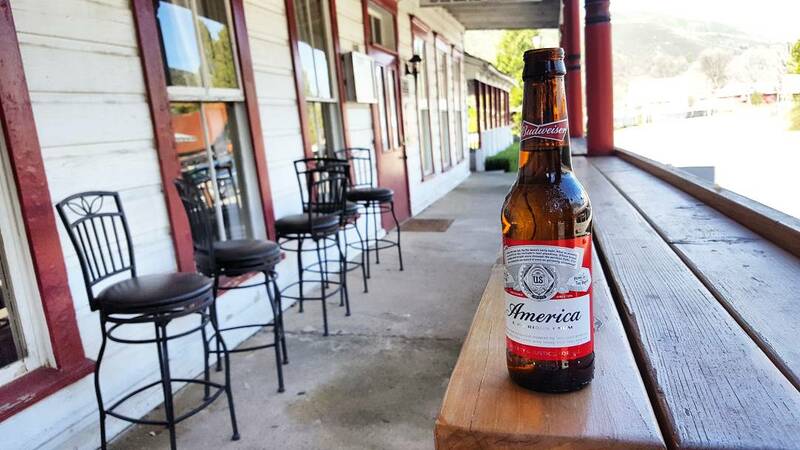 With its newest version of their label, the Budweiser was emblazoned with “America” where their brand once stood. A beer that was around during the time folks flocked to this area in search of gold, it just seemed right. So there I sat, transported back to an era of big dreams of easy money and of striking it rich, on this sunny day in California.